In myopia (short sightedness), the eye is longer than normal or the cornea is too steep, so that light rays focus in front of the retina. Near objects are clear but distant objects appear blurred. In hypermetropia (long sightedness), the eye is shorter than normal or the cornea is too flat, so that light rays focus behind the retina. Light rays from close objects such as pages of a book cannot focus clearly on the retina. 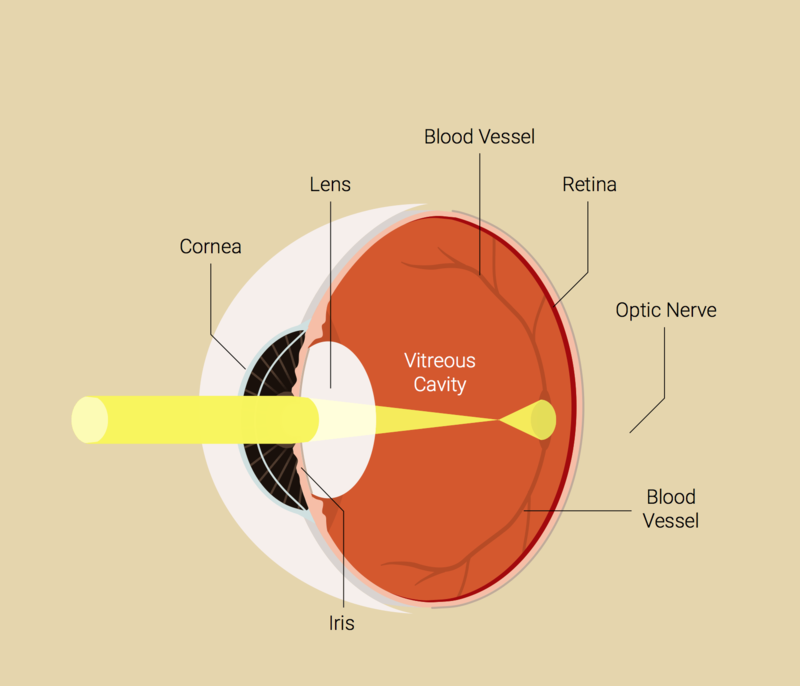 In astigmatism (distorted vision), the cornea is more curved in one direction than in the other. It is shaped more like a rugby ball, than a football. This results in vision being blurred for both near and distant objects. What do the numbers in my glasses prescription mean? Your prescription for glasses or contact lenses is a series of numbers in different boxes. The above prescription refers to someone with short sight and mild astigmatism. OD refers to your RIGHT eye prescription; OS to your LEFT eye prescription. The SPH (sphere) box shows how long or shortsighted you are, measured in dioptres (D). The CYL (cylinder) box shows the strength of any astigmatism, also measured in dioptres. The AXIS box shows the rotational position or angle of the astigmatism on the eye. SHORT SIGHT (myopia) is shown with a minus (-) sign, either before or above the value, in the SPH box. LONG SIGHT (hypermetropia) is shown with a plus (+) sign, either before or above the value, in the SPH box. ASTIGMATISM can be plus (+) or minus (-), and this is shown in the CYL box. The range of sight correction procedures offered by Miss Saw covers any level of spectacle prescription. Laser surgery covers the range +4 to -10D and up to 4D of astigmatism. Lens implants can cover a wider range of focusing errors and can be combined with laser procedures where necessary in order to correct very high spectacle prescriptions. There is considerable overlap between treatment ranges for different procedures. After a comprehensive assessment at your initial consultation, Miss Saw will take a number of factors into account to make a recommendation for the procedure that will suit your eyes best.